The iBert safe-T-seat provides families with exactly what they are looking for in a childrens bike seat; comfort, safety, an attractive and innovative design, and a good position where the child can fully explore the scenery. 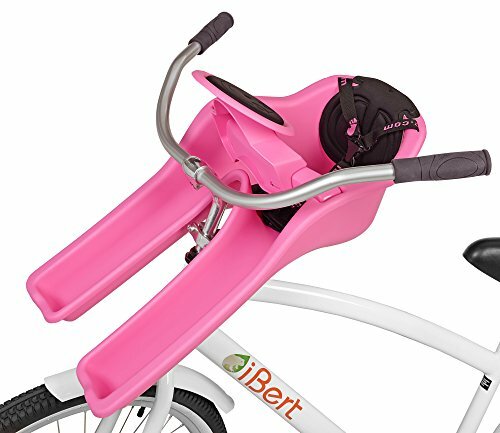 Nestled safely between the adult's arms and behind the protection of the bicycle handlebars, the child can look around and be involved with the ride with mom or dad by turning the padded steering wheel. Center mounted provides a better center of gravity and increased mobility for the adult rider. Better view and more enjoyable ride for the child. The child safely positioned behind the handlebars allows for better communication. Unlike trailers - no dirt, rocks or water thrown in the child's face. Easier, safer loading and unloading of the child. Made in the USA.